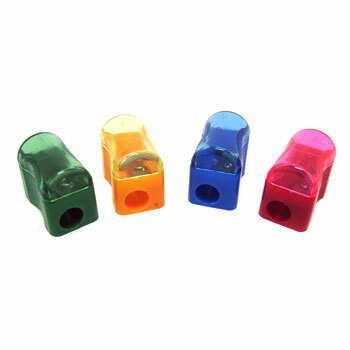 1 inch by 1 inch pencil sharpeners in assorted colors. Removable top for ease of disposing shavings. Plastic. 72 pieces per bag. Sold by the bag. $7.80 per bag (72 pieces). $5.10 per bag for 24 bags or more. $4.40 per bag for 48 bags or more.